My husband John says “Any corn dish has to be good”. This is corn casserole from the "Land O Lakes 75th Anniversary Cookbook" is a little different take on a baked corn dish, as it’s not really a custard. I liked the mild sour cream sauce – we used country bacon from John’s brother, Don. Excellent! I served it with some of Don’s ham steak with redeye gravy –corn...pork... we don’t live in Iowa for nothing! Heat oven to 350°. 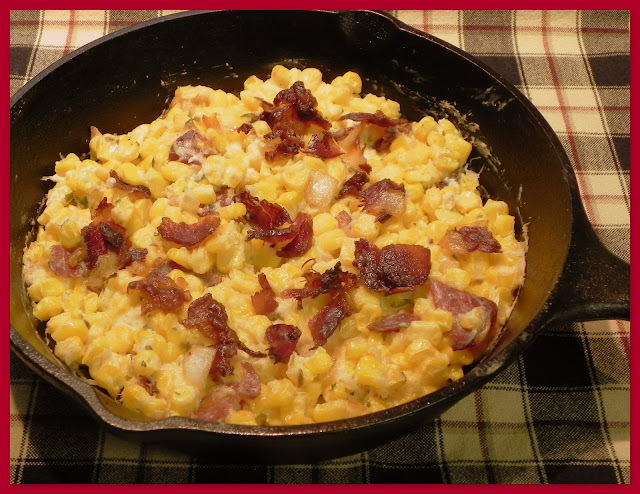 In 10" skillet, cook bacon over medium high heat; stirring occasionally, until partially cooked (4 minutes). Add onion; continue cooking until bacon is browned (4-5 minutes). Drain off fat, reserving 1 tablespoon; set bacon and onion aside. Stir flour, salt, pepper and garlic into reserved fat. Cook over medium heat, stirring constantly, until smooth and bubbly (30 seconds). Stir in sour cream, corn and 1/3 of bacon and onion mixture. Pour into a 1 1/2 quart casserole (I left it in my oven-safe skillet). Top with remaining bacon and onion mixture. Bake for 25-30 minutes or until heated through. Sprinkle with parsley and chives. Per Serving : 201 Calories; 9g Fat (38.4% calories from fat); 6g Protein; 27g Carbohydrate; 3g Dietary Fiber; 17mg Cholesterol; 228mg Sodium. Exchanges: 1 1/2 Grain (Starch); 0 Lean Meat; 0 Vegetable; 0 Non-Fat Milk; 1 1/2 Fat.